I have a confession to make: Cambodia warmed my heart with its incredibly kind, quiet people, but after seeing Indonesia I am totally, utterly in Love with this wild, green, country! Since I started my trip in February, I saw some pretty amazing places, but nothing compares with the beauty of Indonesia. Here are some of the most meaningful pictures from the month I spent there with a brief comment. 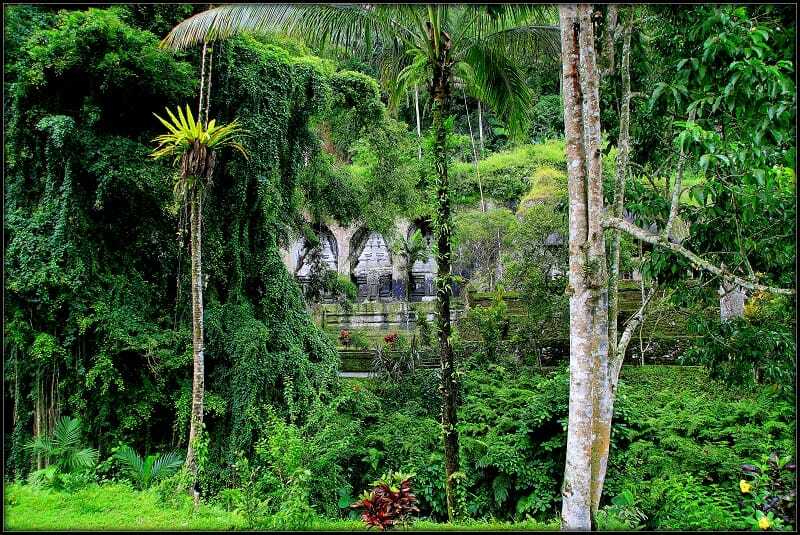 I took this shot whilst visiting one of the many Indonesia temples hidden in the Ubud jungle. It was a very hot and humid day. 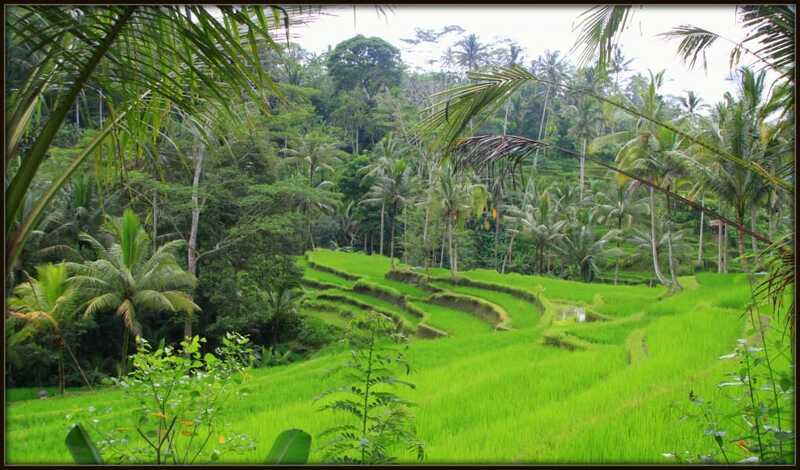 After climbing up something like 200 steps in 40 degrees to get back to our minibus, there it was: a peaceful, green and gorgeous rice terrace. Indonesia is famous for the rice terraces and despite the heat and sweat, I stayed there in awe: The intensity of the colors was stunning. When I think about Ubud, I immediately connect it to the in-famous Monkey Forest: A very controversial place. You love it or you despise it. The love or hate reaction obviously depends on your level of tolerance towards the monkeys. The cute, angry/hungry monkeys sometimes try to “attack” the tourist to steal their food. How to blame them? survivor instinct! I found the Monkey forest one of the most fascinating places in Bali. It’s true, the monkey can be quite scary. Every time I saw one coming towards me, I admit, my instinct was to run away as fast as possible. Nonetheless, seeing them free , in such a wild environment, is an experience worth trying. The Monkey forest is an enchanted place. Even being a touristic park, it preserved its wild nature. 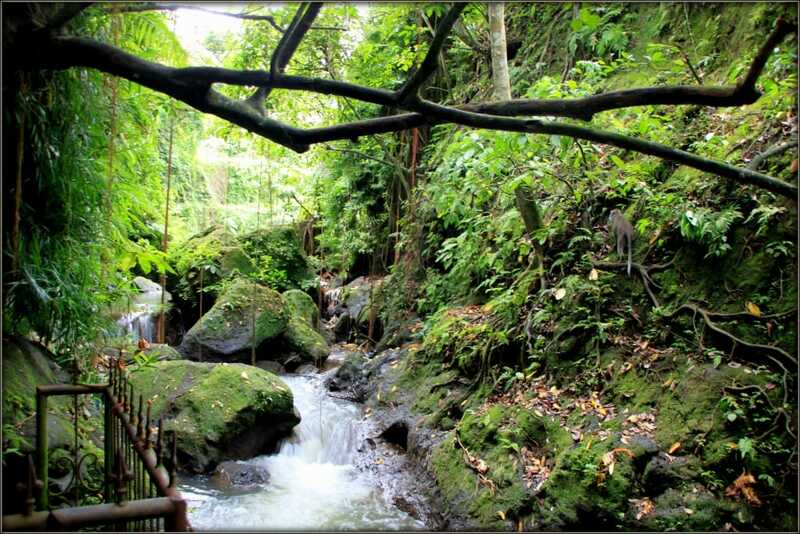 The majestic tropical trees, the small rivers and torrents and the dense green vegetation, surrounding the many Balinese sculptures, is breath-taking. This picture reminds me of one of my dearest moments in Indonesia. I went to see the sunset over the sea, and I took this incredibly wild path to reach the beach. No one was there and soon enough it got darker and darker. I started feeling a bit uncomfortable being there all alone, but the beauty of the jungle swept me away. 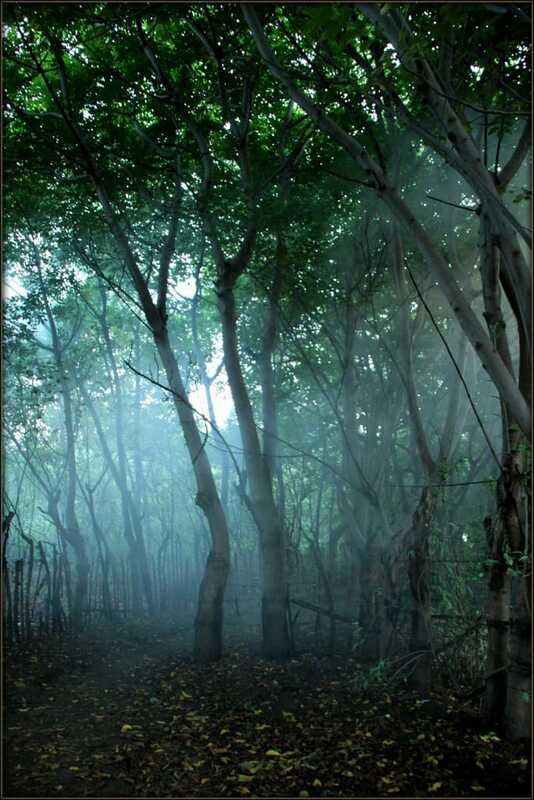 It was magical: the mist and the light filtering trough the top of the trees, the quietness broken only by the sounds of the animals living in the forest,transported me in a dimension where I was just expecting the Genie in the lamp, or maybe Harry Potter, to show up in front of me. I’ll never, ever forget this path. I took this picture on my way back from seeing the most amazing sunset of my life. 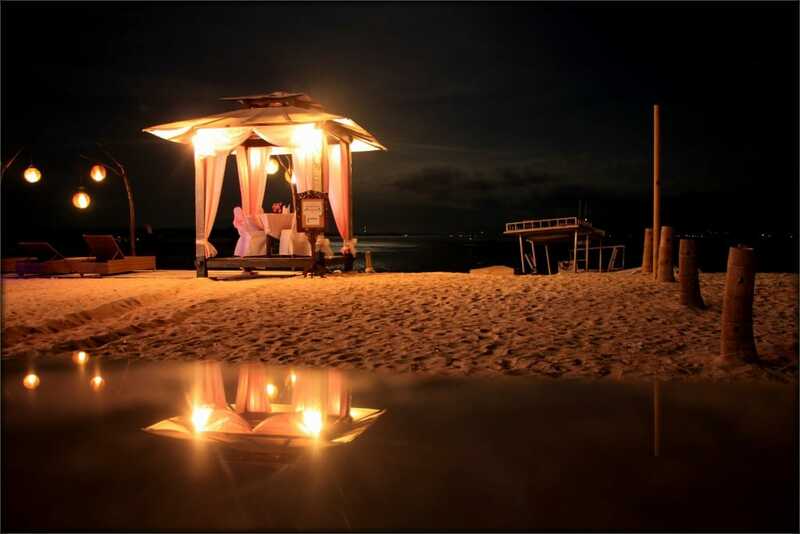 On the main road at Gili Trawangan, there it was: the most romantic dinner table I’ve ever see on a beach. The kind of setting you see only in the movies. That night the scenery was perfect: the moon had just risen from the sea, casting its cold light over the sea, like a smooth silver coating. The only audible sounds were the small waves crashing on the shore. I don’t know you, but that’s what I call perfection! This picture is one of my biggest disappointments. I know it sounds crazy, but you should have been there and watch this sunset with your eyes to fully understand what I’m talking about. For the first time in my life I was speechless. This is not just an average sunset. So many elements made it the best sunset I’ve ever seen in my life (so far): I was coming back from the path trough the “Enchanted Forest” and, when I emerged from the darkness, a painting showed up just before my eyes. The beach was deserted and very quiet. I could only hear the remote sound of waves crashing on the coral reef, where a few people were walking. I could see their shades against the huge, dark, volcano standing in front of me. The colors were so warm and vibrant, and the water between the coral reef and the beach was completely still and perfectly reflecting the shape of the volcano in front. I sat on the beach and stood there, quietly, contemplating the best painting of my life. Do you want to improve your photo skills? read this article! If the sunset was my biggest disappointment, this shot is definitely one of my biggest accomplishments. It was a very exciting moment. I thought Indonesia already showed its best for that day. How wrong I was! I turned my head on the right and what did I see? A huge red moon raising from the sea. I have to admit that my first reaction to that view was not very elegant. I couldn’t believe what my eyes were witnessing . I didn’t bring my DSLR with me and the moon was rising quickly over the horizon. I decided to give it a shot, and I run as fast as I could to my room and get it. 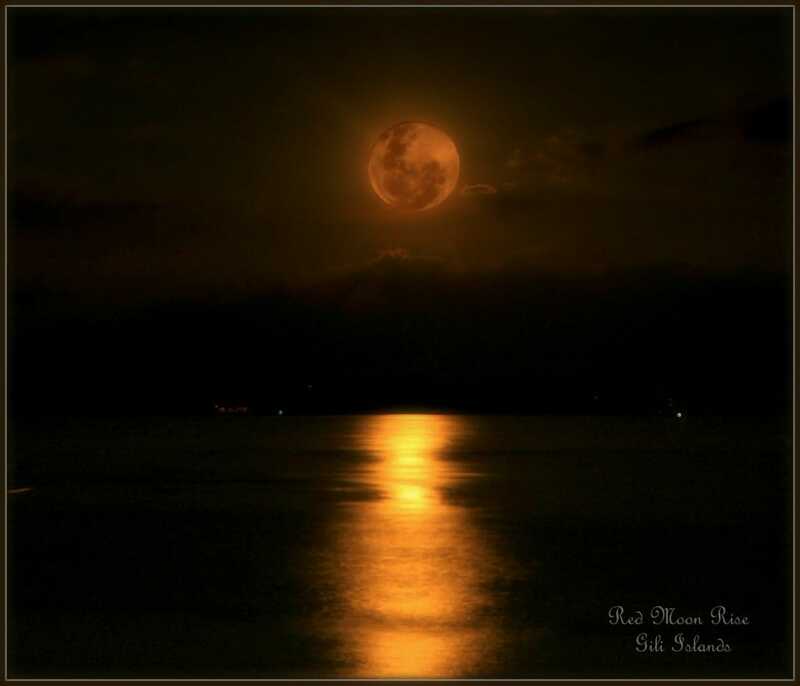 When I was back, the moon was still quite low on the horizon, warming up the water with glittering golden reflections. This shot is the combination of two separate pictures, as it’s physically impossible to get both the background and the moon on focus in the same picture. My boyfriend told me that I was cheating, but in fact I wasn’t. I just recreated what I saw with my eyes. And, as you can see, it was extraordinary! 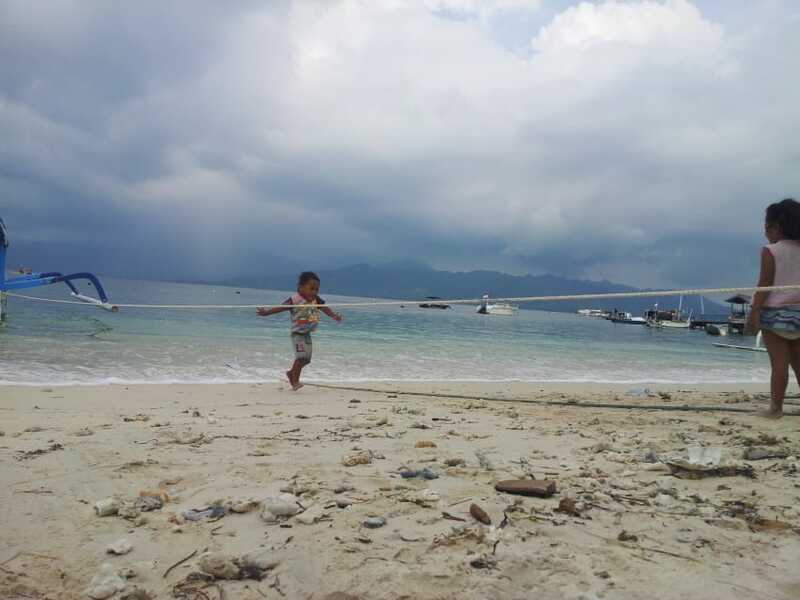 This picture was taken at Gili Trawangan and it represents very well the spirit of Indonesian’s beaches. The bluish colors of the water, mixed with the turquoise sky, the shape of the volcanoes in the background, dark clouds surrounding the mountains and the boats, are the typical scenery of almost every Indonesian beach. Looking at the picture, I can instantly feel the special atmosphere of this place, where the wild, strong elements are the defining part of the beauty of Indonesia. The Ubud area is filled with spectacular waterfalls, this particular shot was taken on the path to reach the waterfall shown on the background. It was breath-taking. Again, the heat was almost unbearable but the fatigue and sweat were well worth this shot! My only regret is that I wasn’t able to shower under the fresh water. To be able to do so, I’d have to cross a pretty large and agitated river and I couldn’t risk that much. I just sat down on the safe side, listening to the powerful sound of the water falling down the mountain. All I could see around were green trees and vegetation all over the place. Extraordinary. This Picture was taken at Monkey Forest in Ubud. 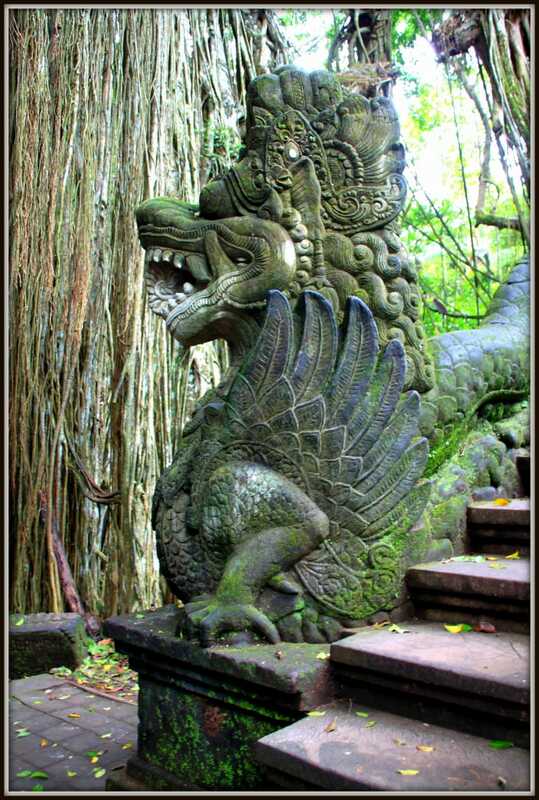 In Indonesia these typical sculptures are almost everywhere and I particularly liked this one, as it is surrounded by majestic wild trees in a combination of art, religion and nature beautifully mixed together. 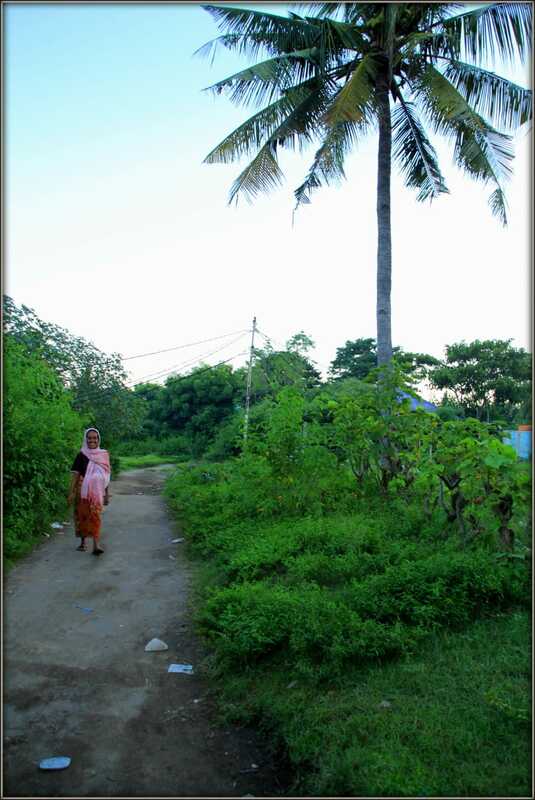 This shot reminds me of a nice encounter with this kind Indonesian lady. I was completely lost while searching for the “Enchanted Forest” and this smiling woman was the only person I met during my walk. She lived in an isolated hut nearby and, using my Italian gestures, we managed to have a conversation and she pointed me in the right direction. Indonesian people are so nice and helpful! always greeting you with a smile and a very kind, nice attitude. Love it. 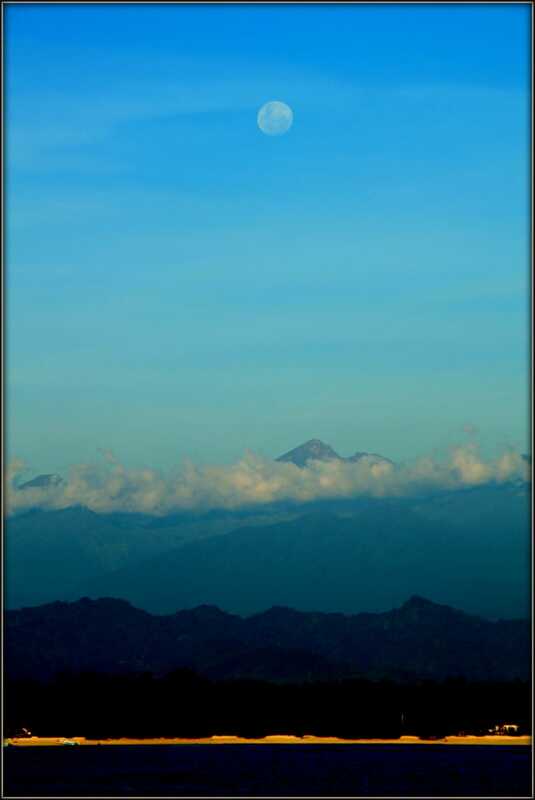 I like this shot, as it mixes several fascinating elements: the full moon, high on the blue sky, the mountains painted in different shades of blue/grey colors, in contrast with the golden beach and the deep blue sea. It gives me a feeling of peace and tranquillity. I love this picture. 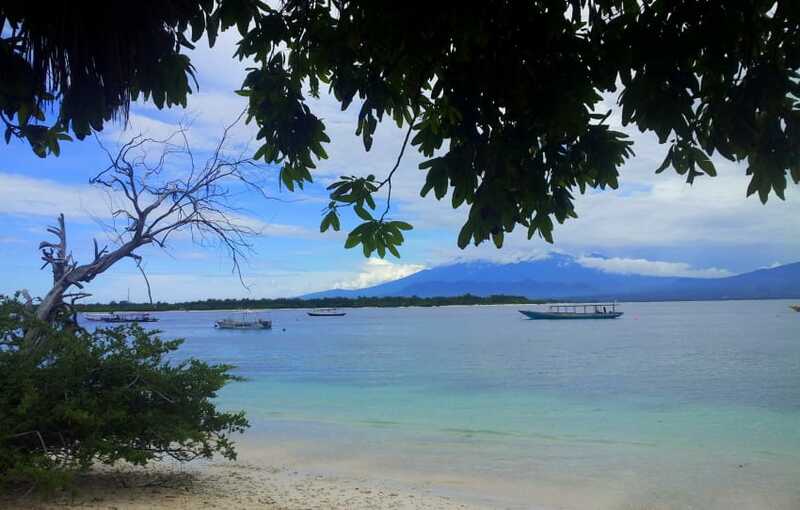 I took it at Gili Trawangan, and it shows the beauty of Indonesia very well. A storm is coming, the sea is agitated and the wind is almost unbearable. Yet these two kids, brother and sister are playfully pulling a rope and having the time of their lives. It represent the simplicity and joy of life in full. 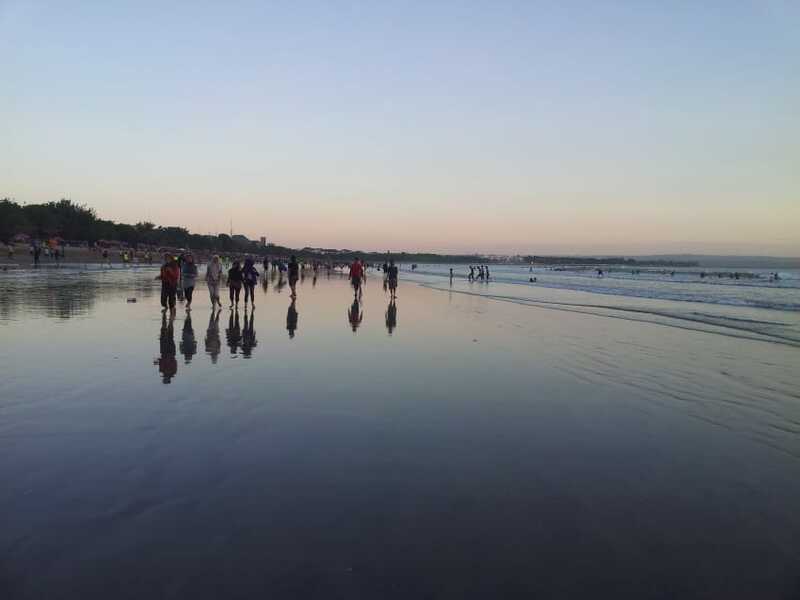 Kuta is one of the most touristic places in Bali. Many people warned me about Kuta. I’ve heard “horror stories” about rude foreigners, surfers and a mad crowd. True or not… I didn’t stay there long enough to see it for myself. Maybe it was my lucky day, as I went there at sunset and I found it fascinating. The beach is huge, long and there is a big string of dark, volcanic sand, constantly reached by the waves, leaving a wet coat on top. The reflections here are so clear that it looks like people are walking on a mirror. 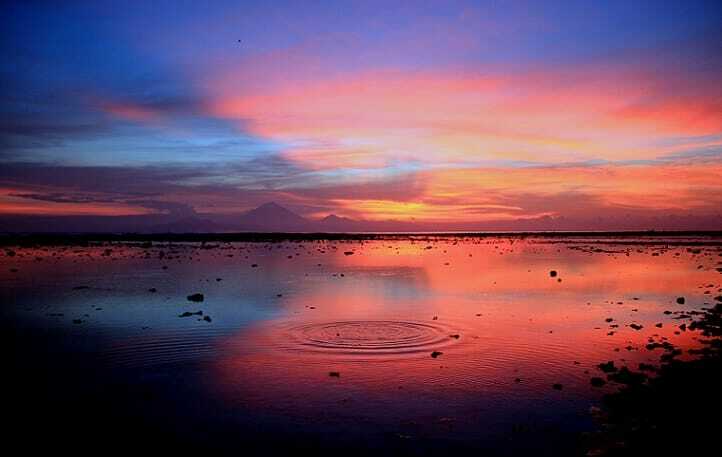 This shot was taken in Kuta, Bali. 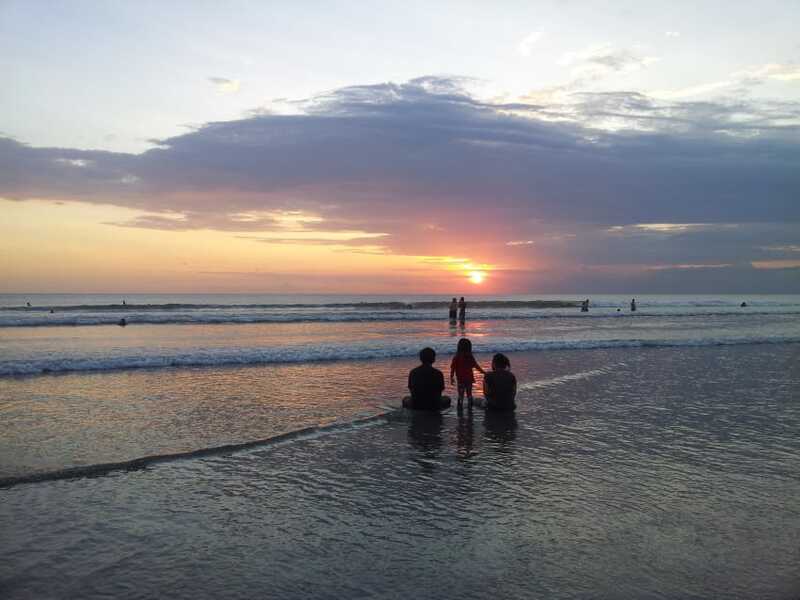 A family just sat on the wet beach to admire the sunset. Such a quiet powerful image of a happy family moment. Plus the sunset was a really peaceful, colorful one. A joy for the eyes and the heart! So, here they are: The 15 pictures that best represent my feelings about Indonesia. I am planning to pay another visit and explore more of this incredible Country. There is so much to see and I can’t wait to be surrounded by the wild Indonesian nature again! I hope you enjoyed the pics! Feel free to comment, add your own thoughts or show me your pics by contacting me for the project “A year around the world in 365 pictures”, by clicking HERE. Really nice pictures! if you have more time maybe you can visit ijen ( banyuwangi ) for beautiful Bluefire! Breathtaking photos Kle! I hope I’ll be able to visit Indonesia one day (too bad it’s really far away from Europe). Dear Kle, I just joint your blog and thanks for coming by my country, Indonesia. Your pics and description are really awesome, so brilliant. You should come to another city in Indonesia, its such an amazing view. And it will become your precious moment when you come to Indonesia again, so btw, where do you come from ??? I’m indonesian i proud be indonesian… thank you so much already loved indonesia…. Beautiful pictures with excellent descriptions. Thanks. Wow, which restaurant was that with that romantic table? You should visit arround Indonesia. I think more people arround the world only know about Bali. Actually, there are thousand of islands, language, dance, culture and of course wonderful beach and mountain. BTW, thanks for visiting our awesome country. Visit me http://djafa.org, may you can find some of my trips. Awesome! I love Indonesia as well, it’s my favourite country. I spent about 14 weeks there, but on several trips, unfortunately. Longest was 4 weeks – still much too short! Although I love Bali, Java, Komodo and Sulawesi, by far the best is West Papua/Raja Ampat. It’s like the last frontier, very wild and special. And if has the best diving in the world, hands down. I have just begun to explore your blog Clelia and and very impressed. Indonesia has always been an important country to me and you have captured some of its enchantment in your gorgeous photos. Can’t wait to visit Indonesia sometime soon. These are amazing pictures- thanks for sharing! We are in Indonesia right now and I love the scenery, temples and local building a lot. I won’t even mention how much I’ve been enjoying Bali nowadays. I’m surrounded by local temples and palm trees- so amazing! Amazing shots ! It was really the most beautiful photography day. You have described Indonesia through shots so beautifully. These are gorgeous photos! I certainly feel inspired to visit more of Indonesia. I only visited Bali back in 2008 and I feel as though I’ve only scratched the surface of possibilities. Amazing photos. You are really an artist. I agree with you about the photo. Cheating would be adding something that wasn’t actually there; combining two shots for a greater depth of focus or higher dynamic range isn’t cheating. You’re just trying to get a closer approximation of what you actually saw with your own eyes. Ansel Adams and many other great photographers did the same thing, albeit in the darkroom as opposed to Photoshop, etc. Beautiful photos. Thanks so much for sharing. It almost makes me want to go back to Bali!